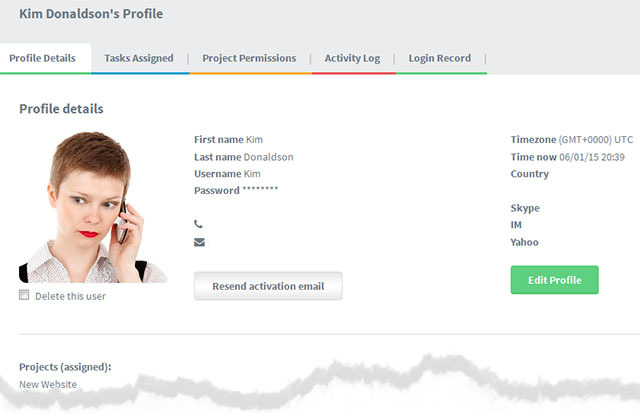 Profile details – where you can edit the users details / password and so on (by using the edit profile button – * see note below). Tasks assigned to – This shows every task assigned to this user. You can sort each column by date / priority etc by clicking on the column title. The account owners and Co-Owners. can change almost anything in the user profile – including the password. To change User Profiles open your “Account settings” screen. Then see the “User settings” section. You cannot edit a sharer’s profile. Only the sharer can do this themselves. The edit profile button will not appear in the Profile details section of someone you are sharng a project with.